Fractures in the tooth. 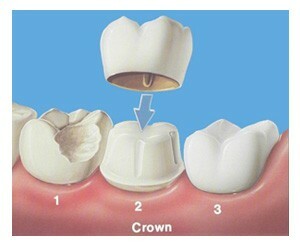 A crown fits over the tooth like a thimble to cover and support the tooth. Many people refer to this as a cap. Most patients tell us that a crown feels much more secure than the compromised tooth and our newest dental materials look just like natural teeth. A crown generally takes two visits. The first appointment is about 90 minutes and we reshape the tooth, make a mold of the new shape and make a plastic temporary crown that you will wear while the new crown is designed precisely for you. We make sure that you are very comfortable during this work and allow time for stretching or rest room visits. The second appointment is about 40 minutes. We slide off the temporary crown and cement in your new crown, making any fine tuning adjustments to make sure it feels natural for you. A bridge is used to replace a missing tooth. A bridge is a crown on either side of the space with the a crown attached in the middle to fill the gap. A bridge is cemented in place so it does not come in and out. It requires the use of a special floss every day to clean underneath the artificial tooth.